Here in the UK, there are few haematophagous arthropods which trouble me. While mosquitoes provide a minor irritation, the Scottish midge Culicoides impunctatus is massively annoying, principally because of the sheer number that typically assail one. For me the bite is more irritating as it occurs rather than an itching after-effect. Generally I come into contact with the Scottish midge while on cycling holiday, and swarms of the blighters can make even the most lovely campsite intolerable. However the beast that irritates me more than any other is Neotrombicula autumnalis, commonly known as the harvest mite or berry bug. The common names reflect both the season in which N. autumnalis larvae become active and the activities which bring people into contact with them. This blog article was inspired by a pair of bites I picked up this week. Most people who suffer from N. autumnalis first become aware of quite severed itching and raised reddened lumps that are typically found around clothing constrictions, typically underwear elastic. But by this time the little devils are usually long gone, leaving several days of irritation behind them. So what are harvest mites? 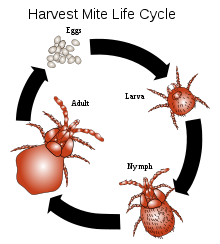 Harvest mites are small arthropods, with a life cycle as shown in the figure (from Wikipedia). It’s a typical mite life cycle: the offending stage is the 6 legged larval stage, of which more later: one phase of the nymph stage and the adults are active predators on other small arthropods. This life cycle diagram is a slight simplification. The nymph stage is actually composed of three stages, the protonymph (an inactive stage entered after the larva has finished feeding and left its host), the deutonymph (the active nymph stage during which the animal feeds on other, presumably smaller, arthropods) and the tritonymph (a second inactive stage after which the adult emerges). For this purpose, it’s the larval stage that is of interest: this is the only stage in which the animal feeds on a vertebrate host (see image to left). These beasts lurk on the tips of grass and other leaves awaiting a passing animal. When the animal brushes the leaf, the larval mite climbs aboard and crawls about, seeking a suitable attachment point. For some animals this will be areas devoid of hair or thin skin, such as around the eyes or in the ears. In the case of humans, this is frequently at points of clothing constriction – usually the last place you want to develop an itch! Larval trombiculid mites don’t actually bite, or drink blood (so my depiction of them as haematophagous is rather stretching the point): rather they pierce the skin, injecting digestive juices and sucking up the resulting fluids. This goes on for a few days after which the mite drops off the host and falls to the substrate. This process causes a tube of hardened skin called the stylostome to form, and it’s through this that the mite continues to feed. Apparently it’s only after the mite has departed that the bite becomes noticeable, by which time the culprit is long gone. Fortunately in temperate areas such as the UK, trombiculid mites only have one annual generation, with larvae being active in summer and early autumn (hence the association with berry picking, crop harvests and, in my case, mushroom collecting). In tropical areas, trombiculids breed rather more frequently, with the life cycle being completed in around 40 days. Here in the UK, harvest mites don’t transmit disease, but this isn’t the case elsewhere. In south east Asia, trombiculid mites are knwon to transmit scrub typhus (also known as Tsutsugamushi), caused by the bacterium Rickettsia tsutsugamushi (aka R. orientalis) – rather than being a typhus, it’s actually a Rickettsiosis. Severe attacks may lead to dermatitis as the rashes and pustules merge. I’m not personally aware of any particularly effective treatment for the “berry bug itch”. The Pied Piper pest control website has a section on harvest mites that recommends the following – both seem to be very sensible advice. If you’ve visited a site known for harvest mite infestation, wash your clothes in hot soapy water, and have a good hot shower. The larval mites will be wandering around your body and clothes, the hot wash should kill them. Unfortunately the realisation that one may have been in infested terrain may only surface once the mites have gone and you have the itch… Scratching can cause secondary infections: temporary relief may be provided by ointments of benzocaine, hydrocortisone, calamine lotion, or other things that may be recommended. For what it’s worth, I’ve tried calamine lotion, it works for a very short time! The pet health website PetWellBeing.com recommends (for dogs) the topical application of steroids to alleviate the severe itching. Ultimately, my opinion is that the best treatment is probably to ensure you don’t scratch the lesion! Lane & Crosskey “Medical Insects and Arachnids” Pub 1993 Chapman & Hall. Try Tiger Balm to soothe the itch. It works for all itchy bites, but is the only thing I have found that really works for berry bugs. I live in central Scotland, in the Clyde Valley, and our garden is infested with these pests. They appear around the end of June and are active for at least 2 months, tapering off in September. We’re not usually totally free of them till around October. I have found that wearing wellies if I have to step out into the yard (to hang wash, etc) does the trick. However, if I need to work in the garden or accidentally brush against any foliage, the only thing to prevent getting bitten is an immediate hot and soapy shower, and all the clothes I was wearing put into the washing machine. What actually stops the itch …for a reasonable length of time, is the application of VERY hot water, usually with a wad of paper towel. Get the water as hot as you can stand, and hold the compress over the bite for 10-15 seconds. The thing will itch like fury when the compress is on, but as soon as you remove it, the itch stops. Usually for several hours. Obviously you need to be careful not to actually burn your skin, but this does work. For years I have been trying to identify the invisible biting pest that gets under my bra strap etc in late summer & at last the Robert Saunders site has told me. We live in deep countryside in Herefordshire , I garden and walk dogs daily. So now I have the answer. I might add that my husband does not get bitten at all; but then he doesn’t get attacked by mosquitoes either; must be something in the blood. Many thanks. We have the beast in our garden. We have found putting Avon skin so soft, original around our ankles and on/around our footwear really helps to prevent getting bitten. We have just been bitten to smithereens by these notes while camping in a friend’s garden. Any ideas how we treat the camping bedding? It includes large roll up padded mattresses, so not practical to put in the washing machine. All advice welcome!